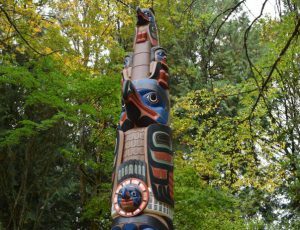 The figure at the base of the pole represents the Eagle Prince in the “Origin of the Eagle Clan” story. He is depicted here, as he was later in life, a wealthy and powerful chief. His mouth is open as he sings a welcoming song to invited guests. 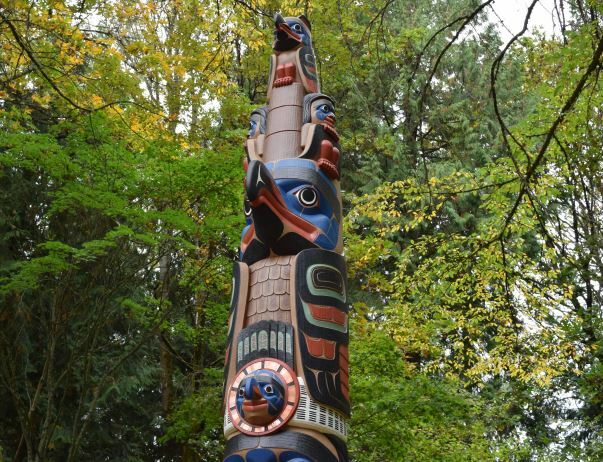 On October 8, 2015, the City of Seattle installed a beautiful totem pole in the Native Knoll section of the Arboretum. 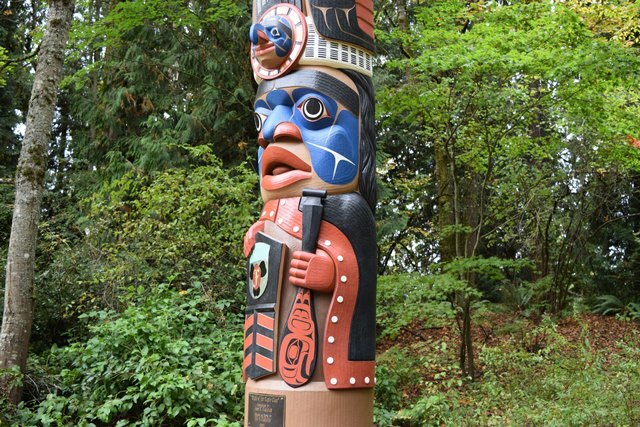 A gift to the Arboretum Foundation from the family of local business and civic leader Jim Faulstich (1933-2013) and his wife Gretchen (1933-2015), the pole was carved by Jim’s cousin Dale Faulstich, a non-Native-American artist who has carved more than 50 totem poles for the Jamestown S’Klallam Tribe of Sequim, Washington. A generous gift: Jim and Gretchen commissioned Dale to carve the pole in 2003 for their home on Mercer Island, Washington. In 2012, Jim and Gretchen decided to donate the pole for display in a public space and approached the staff at the Arboretum, who were very excited about the gift and began to plan for its arrival. The second file on the pole is the Eagle Princess. She is shown her in eagle form, looking out to sea, provided her protective spirit over her husband. On top of her are three “look outs,” whose job it is to warn the village of an approaching canoe. The story is about the son of a powerful chief who sets out in his canoe to catch fish but is marooned on an island during a storm. He is rescued by a young woman, who turns out to be the daughter of the powerful chief of the Eagles. She brings him to her village, the youngsters eventually marry, and as a wedding gift, the young prince receives a magical garment made of eagle feathers, which allows him to fly and travel long distances. Using the garment, he performs incredible feats of hunting, such as bringing a whale to shore using his bare talons. While the prince hunts, his wife transforms into an eagle and sits atop a tall tree awaiting his return. She is the source of his magical power. The prince eventually returns to his village with his wife, reunites with his family and becomes a wealthy but very generous chief. 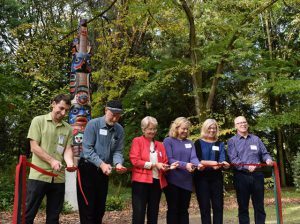 A ribbon-cutting ceremony for the pole was held on October 16, 2015. From left to right: Mike Schwindeller (Seattle Parks), Dale Faulstich (pole carver), Paige Miller (Arboretum Foundation), and the Faulstich family (Clairann, Julie, and Robert). The Faulstich connection: The figures on the pole also represent the members of the Faulstich family: Jim (the Eagle Prince), Gretchen (the Eagle Princess), and their three children (the “lookouts” on top of the pole), Julie, Clairann, and Robert. Thank you! The Arboretum Foundation and its City and University partners at the Arboretum would like to thank the Faulstich family for their generous donation! Thanks also to Dale Faulstich and his crew for overseeing the refurbishment and installation of the pole, and to Jamestown Excavating for helping install the pole.